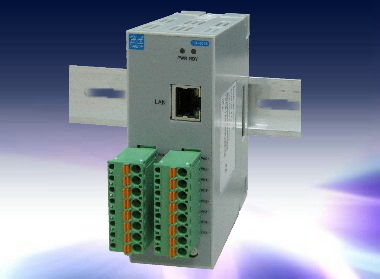 Leader-5000 is a series of Ethernet-based block I/O modules for distributive monitoring and controls. The block I/O modules feature built-in RSIC-based processor with MAC, and capable of performing analog I/O, digital I/O, and temperature measurement in an Ethernet network with Modus/TCP protocol at LAN, intranet or Internet. A Leader-5000 block I/O module can simultaneously serve communication from different Ethernet socket ports. For example, HTTP, HAL Windows-based utility and Modbus/TCP Server. OPC server and various C++/C Modbus/TCP communication driver are provided for user to choose the easiest way to have the Leader-5000 block modular I/Os to go with his self developed software or HMI/SCADA package. Support "configuration via built-in Web browsing, (HTML), Device Finder and I/O configuration utilities"
Block I/O Utility allows you to configure and monitor Leader-5000 Ethernet-Based I/O modules remotely. The Utility automatically scanning installed Leader-5000 Ethernet-Based block I/O modules. With Block I/O utility, you can browse available units, view the status of each channel, configure the I/O settings and configure the active I/O logic rule and alarms. The "I/O Status" page, it can monitor the current working status of each channel both on DI and DO and Peer-to-Peer I/O Active Status. The "I/O Configuration" Page: Can configure the DI/DO mode and check status for each channel. Easy to configure the DI/DO mode and check status for each channel on "I/O Configuration". The I/O logic rule provides one-time operation in each entry. The theory is the same as the "IF-Then" rule. It's easy to understand rules, no need to know extra program script to configure this. In Logic Rule #ID Configuration page, select "Enable" and configure the Condition and Actions then press "Apply" to enable the rule. When the "Conditions" is reached, the system automatically activates the "Actives". The maximum I/O logic rules for Leader-5068 support are up to 7 rules. Each rule can support up to 4 different conditions and 4 different actions. The "Alarm" Page, easy to configure the I/O logic rules, alarm message and "peer to peer" I/O activity. Support up to 4 different conditions and 4 different actions. SNMP Trap Setting: Configure up to 4 SNMP Trap Server’s IP. Configure module's input channels mirrored to remote IP & configure module's output channels mirrored from remote IP. Enter the IP address of the Ethernet-based Block I/O Modules in Internet Explorer. Then you can access the embedded web browser of the I/O server. The web browser allows you monitor the information/status of each channels.